In the last post, I examined why taxes seem to surprise so many authors whose books become moderately successful for the first time. In this one, we’re going to talk about the Estimated Tax requirement. This is mostly for new authors or those who are just now hitting some level of success – say a few hundred or a thousand dollars a month (profit) or a first traditional contract of several thousand. After the first year of that, and getting bit by the penalty for not paying estimated taxes, most get it figured out. Which is sort of like having to do you taxes five times a year, in my opinion. This is why I use a tool, which I’ll pitch up front, to do most of that for me. I use Quickbooks Self-Employed (http://fbuy.me/d2DLB) and recommend it to anyone making enough for this to be a complicated issue. At $10/month, it’s worth it. Quickbooks SE (and the version is important, they have, like, seven versions available, Self-Employed being a less-expensive and easier version to use), aside from all its other features, calculates your quarterly tax payments for you based on your real income and expenses. It also takes into account your day-job income, so knows what bracket your author earnings will fall into – and it’s real time. That means it will calculate and recalculate right up until the quarterly deadline based on your real numbers. There’s a lot else it does, and I’m going to recommend it several times during this series. A quick method of dealing with estimated taxes that doesn’t cost a monthly fee for a tool is to just pick a percentage — 30% or 40%, depending on what bracket you fall in – and set that aside from all income, then just send it to the IRS quarterly. In this case, you’ll likely overpay, as you aren’t really tracking your profits and taking expenses into account, but you’ll get the extra back when you file your return. I’m not a fan of giving the government interest-free loans, but you should make your own business decision about whether it’s worth the avoidance of time and energy spent on a more accurate quarterly calculation. If you’re the sort who has difficulty with money laying about – such as wanting to “borrow” it for other things – then quarterly payments might not be for you. Even though the form from the IRS has quarterly vouchers, you can make estimated tax payments anytime if you do it online (https://www.irs.gov/payments). You specify the current tax year and that it’s an estimated payment, then send the money on your schedule. This is a good method if you want that money out of your accounts on a monthly basis, right after the royalties come in, so you’re not tempted. So, yeah, if that idea would ever appeal to you, do the monthly payment thing. It works with Quickbooks SE too, you just have to do the math on what Quickbooks is calculating for the quarter, and it’s what I do. If Quickbooks is saying I’ll have to send $3000 for the quarter and it’s the first month of the quarter, then I send $1000 as soon as my royalties for that month come in ($3000 / 3 months in the quarter). If the next month isn’t quite as good, then Quickbooks will recalculate it and track what I’ve paid. So the second month of the quarter might end with QB saying it’s now going to be $2000 for the quarter, and I then send in $500 ($2000 minus the $1000 I sent the previous month, so $1000 / 2 months left in the quarter). It’s variable, but it works for me. The important thing, whichever system or tool you use, is to make sure you’ve paid enough in estimated taxes to avoid the penalty. Basically, you’re not allowed to owe them more than $1000 come tax day … they’re perfectly happy to owe you several thousand as your “refund”, though. Go figure. Your first year of writing success will probably be safe from the penalty if you have a day job consistent with the previous year – this is because you’ll have paid roughly the same amount as last year in day-job withholding, which meets the “100% of the tax shown on the return for the prior year” requirement to avoid the penalty. Your second year of success, though, won’t have this advantage because you’ll have that tax on book income that won’t have been covered by withholding – unless you typically receive a really large refund. At least four times a year you need to estimate your income and expenses then send a check to the IRS. 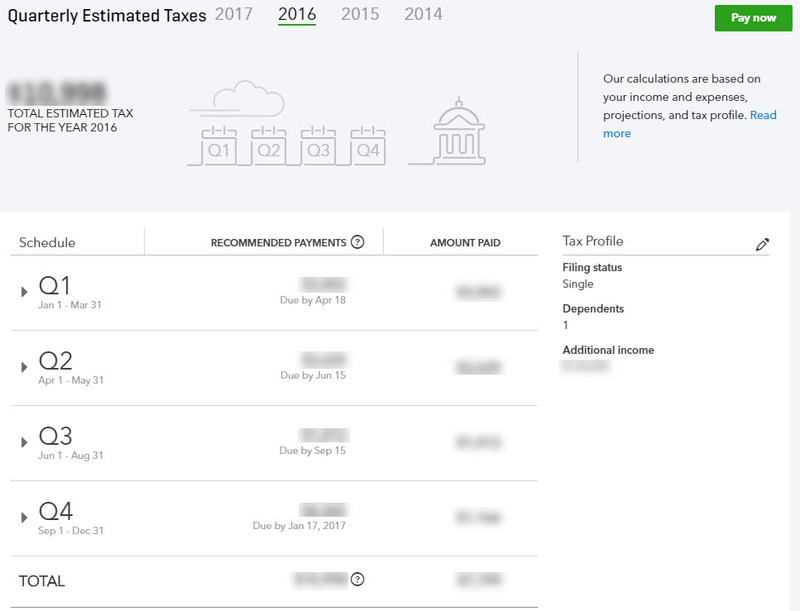 Use the IRS’s form (https://www.irs.gov/pub/irs-pdf/f1040es.pdf) or get a tool like Quickbooks (http://fbuy.me/d2DLB) to make the calculations. Make the payments monthly (https://www.irs.gov/payments) instead of quarterly if you have trouble with setting money aside for several months. Next up will be a post on deductions (coming soon), and why you should be tracking your expenses even if you haven’t published your book yet.